When Aslan Noakes was a young girl, she went to a church service where something unusual caught her eye – shiny white shoes. The owner was Haitian, and Aslan never forgot him. Fast forward 10 years to the aftermath of a 7.0 magnitude earthquake that rocked Haiti in 2010. Aslan was finishing her nursing degree, and when she heard of the quake her thoughts turned to the man in the shiny shoes. Like some, she wondered if she had a skill set that could help those affected. Unlike many, she boarded a plane six weeks later to turn her compassion into action. Growing up in a household with both her mother and grandmother who were raised Irish Catholic New Yorker, Aslan was immediately drawn to the Haitian culture – the people, the noises and colors. After a few initial trips to learn about Haiti’s history, culture and challenges, Aslan remained committed – but disillusioned. She also learned two key tenets of OSU’s program: Change must be sustainable, and sometimes the smallest change has the biggest impact. “Haiti made me go to graduate school,” says Aslan, who completed her MPH in 2015. A degree, however, wasn’t enough. While still at OSU, Aslan created Empower Haiti Together, a for-profit social business akin to TOMS Shoes, with the goal of providing jobs, supporting the local economy and working alongside Haitians to help improve their health and well-being. She began small by partnering with Papillon to buy and sell jewelry wholesale to raise money. She then added more trips, including taking OSU students who wanted an international experience. These students weren’t limited to public health, but also engineering and business and later nursing students from Linn-Benton Community College. 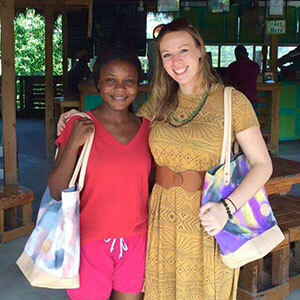 In 2016, she raised enough money to begin renting a home in Port-au-Prince that she uses as a guest house for student groups coming to Haiti on her Experience Haiti trips. She also uses the house as a revenue source for community projects by renting it out to other individuals and groups working in Haiti through Airbnb. Additionally, the home is being used as a location to train Community Health Workers (CHWs), and even served as a shelter during the most recent hurricane. She’s also being careful to be inclusive and collaborative and to partner with communities, learn and listen, and most importantly do no harm. For example, she’s currently working with two partners on concerns over lack of primary health care. The community wants a clinic, but Aslan says this creates new challenges, such as funding – and finding people who want to live and work there. The solution, she says, comes from thinking about what can be done now, in the short term, which includes training Community Health Workers, having lots of conversations and being willing to compromise. 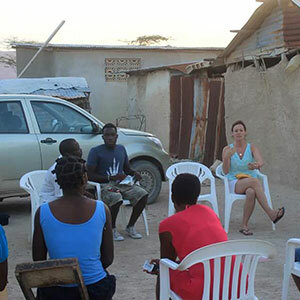 She just returned from two trips to Haiti in December and January 2016 to begin training CHWs, which began with 12 volunteers, elected by their communities, who learned CPR, the Heimlich Maneuver and rescue breathing. MPH candidate Lawrenza Bishop, who is a certified CPR instructor, led the trainings. Aslan will be returning over spring break with another student group to teach manual blood pressure reading and basic ankle sports medicine. Solutions also come from learning what you don’t know and being willing to ask for help. Aslan herself has learned Creole – and is learning about things she never imagined, such as inverters and off-grid electricity and planning for a new business start-up this June 2017, the Port to Port (Portland to Port-au-Prince) food truck, with hopes of involving students from OSU’s College of Business and Linn-Benton Culinary Arts. Progress, however, never seems fast enough when people’s lives are at risk. But she is undeterred, and being a parent only deepens her resolve. To avoid being simply another good intention gone bad, Aslan flips the paradigm. “You think big organizations equal big impact – and they can. But they’re like big ships. They move slowly, they change direction slowly and they are slow to listen. Still, it’s hard work. And this working mom has plenty of reasons to give up.